Is the ‘Why’ Question the Wrong Question? Why did this happen? Did God do this? Or, at least, allow it to happen? We often struggle to make sense of the presence of disability in the world. This much is certain: There are wide ranging perspectives, each built on a framework of love and caring, and each offering a bit of insight into those attempting to answer the question. “God sent this to make your faith stronger,” you might hear; or, it’s close companion, “God never gives you more than you can handle.” The statements assume that, at least to some extent, God is in the business of making mischief in people’s lives (albeit toward a positive outcome). While there may be theological and practical problems with that point of view, the real problem may not be in the answers but in the question itself. 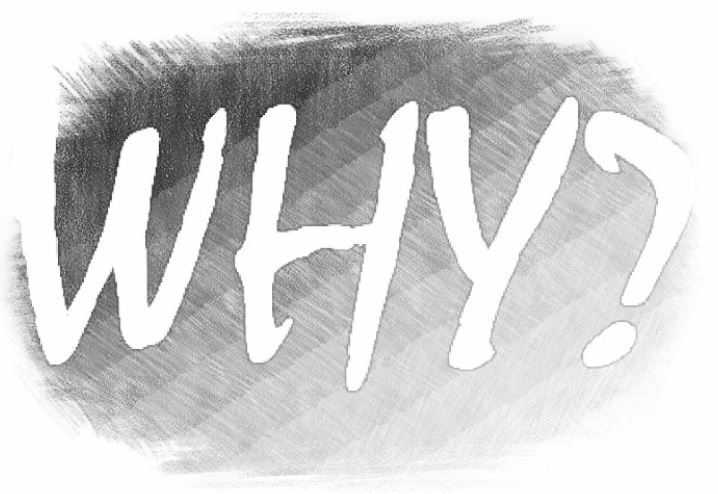 Why would we ask why? The assumption the disciples are making is not completely out of character with what people might ask today. Tell us, Jesus, what went wrong. Tell us who is to blame? Tell us how this might have been avoided? This man has our pity, but we’d like a few answers, if you don’t mind. “Neither this man nor his parents sinned;” Jesus told them, “he was born blind so that God’s works might be revealed in him.” Jesus doesn’t so much give an answer as he does a response. As I read the words, I can almost hear him say, “You’re focusing too much on the past and it’s making you lose sight of the real issue.” Stuff happens. And it happens so that the works of God might be revealed. Taken a step further, there is perhaps another more important question. If we are bold enough to ask that question, we may discover that Jesus’ answer is unchanged. This happened that the works of God might be revealed. In me. Today. This brings to mind a recent discussion at home prompted by a tv interview excerpt we watched on Facebook. The interviewer asked the thirteen year old sister of an autistic teen if there was a cure for autism would you want it for your brother? She gave a surprising answer in my estimation, wise beyond her years, that she would not. After giving it some thought, I have to honestly say my final answer was no, too. I would not want my autistic son to be different than the person that I love right now for who he is. (Incidentally, I feel this way about all of my sons) And I certainly would not want him to lose what I believe are amazing abilities such as, living life for today, being totally honest in relationships, never holding back, forgiving quickly, and not worrying about the future with the exception of what TV show or movie premiere he’d like to see. I think we would all be better off with simplicity like that in life. I believe lessons like these are why God gifted him to our family. Reminds me of a story I read once about a conversation between a father and son. He had assured his child with a disability that, when they got to heaven, he wouldn’t have his wheelchair anymore, his glasses or his hearing aids. Also, his speech difficulties would be gone and he would be able to ‘sing like the angels’. The son’s response was simply, “How will you know it’s me?” Good question. Probably my favorite bible story, the book of Job would have a lot to do with this topic!